Bob (voice of Craig T. Nelson) is left to navigate the day-to-day heroics of “normal” life, giving him an opportunity to bond with his younger son, Jack-Jack in INCREDIBLES 2. ©Dinsey-Pixar. Violet protects her family by throwing one of her most super force fields yet. Featuring Sarah Vowell as the voice of Violet, Holly Hunter as the voice of Helen, Craig T. Nelson as the voice of Bob and Huck Milner as the voice of Dash, DisneyïPixar’s INCREDIBLES 2. ©Disney-Pixar. INCREDIBLES 2 features the voices of Holly Hunter as Helen aka Elastigirl, Sophia Bush as Voyd, Phil LaMarr as Krushauer and HeLectrix, and Paul Eiding as Reflux. ©Disney-Pixar. Bob Parr aka Mr. Incredible attempts his most heroic feat yet: spearheading life at home with Violet, Dash and baby Jack-Jack, whose super powers are about to be discovered by his family in INCREDIBLES 2. ©Disney-Pixar. Helen (voice of Holly Hunter) is in the spotlight, while Bob (voice of Craig T. Nelson) navigates the day-to-day heroics of “normal” life at home when a new villain hatches a brilliant and dangerous plot that only the Incredibles can overcome together in INCREDIBLES 2. Also featuring the voices of Sarah Vowell as Violet and Huck Milner as Dash. ©Disney-Pixar. Savvy siblings and business partners Evelyn and Winston Deavor summon Frozone, Elastigirl and Mr. 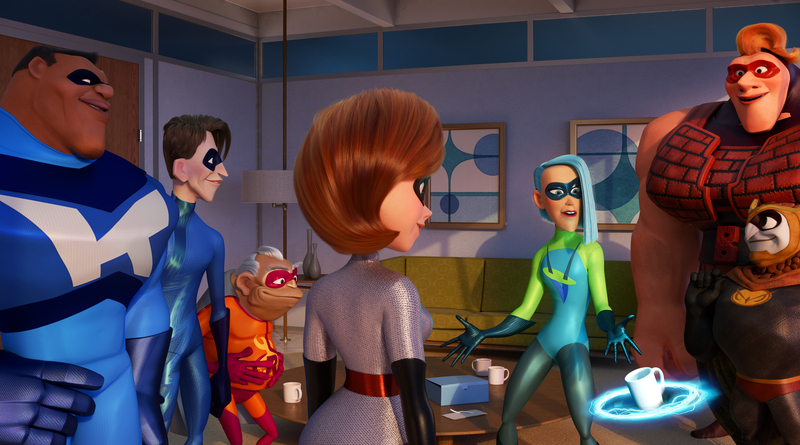 Incredible to share a plan designed to ultimately make Supers legal again in INCREDIBLES 2. Featuring Catherine Keener as the voice of Evelyn, Samuel L. Jackson as the voice of Frozone, Holly Hunter as the voice of Elastigirl, Craig T. Nelson as the voice of Mr. Incredible and Bob Odenkirk as the voice of Winston. ©Disney-Pixar. Previous PostPhotos: ‘Tomb Raider,’ ‘Sherlock Gnomes,’ ‘Orange is the New Black,” More on Home Entertainment … Plus Giveaways!! !